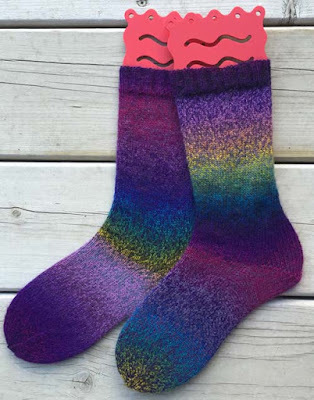 I've finished up another pair of socks. I still have a couple of other socks on the needles and I plan to finish them soon, too (fingers crossed). While I certainly did not need any more sock yarn, this colorway called to me while I was in London. I figured that, if I was careful, I might be able to make a block for my Travel Afghan with part of the ball, make a pair of socks and maybe have a tiny bit left over to add into other projects. I achieved it with no yarn remaining. Normally I try to make my socks match each other but I thought that it might mean some yarn would be wasted. I'll live with my mismatched socks...this time! Actually, I'm quite pleased with the way they turned out.